Update: The winner is #164 Farscapegirl. She said, "I'm just having fun jumping around different blogs taking part in the giveaway. Your giveaway is very generous! Thanks for chance to win a bunch of cool sewing stuff!" It's Sew Mama Sew's Giveaway Day! Today I will be giving away some vintage sewing supplies handed down to me. It's sort of a conglomeration, but vintage sewing supplies are fun to use and display. I have many more of these supplies in a glass jar in my craft room. To win, please leave a comment. Any comment will do, but if you need a topic, tell me about your favorite sewing tool. :D US Only please. The contest will close Friday, May 25th at 3 PM EST and I will choose a winner by Sunday. Enjoy your stay, feel free to follow and come back and look around! I am so thankful for the rotary cutter! What a life saver. Thanks for a chance to win. Would seam ripper be a little too honest? Thanks for the giveaway! i love my walking foot, thanks for the generous giveaway! My left-handed Gingher scissors. Best purchase ever, and worth every penny! I work with a lot of vintage pieces... could definitely put these to work! My rotary cutter is my best sewing friend - how did I ever sew without one? I LOVE vintage stuff!! I'd have to go with my seam ripper. Don't know what I'd do without it. My favorite sewing tool is the ruffler foot for my sewing machine. Also love fine tip scissors. What a wonderful giveaway! Thank you! My favorite sewing tool is a good 'ole fashioned needle and thread! Rotary cutter by a landslide! That looks awesome! Am I allowed to pick my sewing machine? It's a tool, after all- a seriously awesome one. Very fun! I love my turning tool, pattern weights and magnetic pin bowl. :) Thanks so much! Too fun! Some of those things used to or still are, in my sewing stuff. Love it! Who can livewithout their trusty seamripper!? They are so lovely. Seeing such things makes me want to go thrifting more. Seam ripper. Every time I misplace my 4 seamrippers I cannot keep sewing-they just keep it all going. i love my seam ripper=great giveaway=thanks! My favorite tool.... I love my pattern weights. I made them from two giant washers and wrapped them in yarn so they're all pretty. I think I made 8 or 10 of them? Anyway, they are so awesome for cutting out, since I detest pinning! I love my rotary cutter...I'd be lost without it. Thanks for sharing such a great giveaway prize!! I love vintage sewing supplies! My favorite sewing tool has to by my shape cut (with my rotary cutter). It makes cutting strips so easy! So. Many. Vintage. Sewing. Supplies. AAAAAAAAHHHHH!!!! I couldn't live without my pinking shears. I use them for EVERYTHING. If we go by most use, it's definitely my seam ripper! My favorite sewing tool is needle and thread but the most useful tools are ba far my...... HANDS! ooh - I love those strawberry tins. I love my giant self-heal cutting mat - I use it for cutting fabric and all kinds of other crafts! You had me at VINTAGE! I love rotary cutters and just broke 2 in the last few weeks. Yes, I have been cutting alot of fabric. Thank you. Thanks for the fun giveaway! My favorite sewing tool isn't really meant to be a sewing tool at all. It's a clear plastic ruler with a zero in the middle and inches going outward in both directions. It's marvelous for finding the middle of things. Unfortunately, it's only 12 inches long, but I love that thing! My favorite is the rotary cutter! Don't know how I ever made quilts before they came along. Oh, oh, oh! Look at all that vintage goodness! I love to use my rotary cutter. I really like embroidery hoops-so useful! I love vintage sewing supplies! My favorite sewing tool? I guess just my really lovely Gingher fabric scissors. I never realized how crappy my old cutting tools were until I coughed up and got a really nice set of scissors! My seam ripper has come in handy far too often, I must say. I have a seam guide that I screw into the bed of my sewing machine & it keeps my seam allowances correct. Wouldn't sew a quilt block without it (unless I'm paper-piecing). Thanks for the giveaway. ooo, what fun! i love vintage sewing items, i collect them. my favorite sewing tool is a needle and thread , you can do anything with that. Oh sooo cool - I love your giveaway!! The humble overworked and much loved sewing machine is the best tool in my books!!! Fun! I have to say my rotary cutter, for ruler cutting, free-form cutting and thread trimming, I use it almost as much as my machine. Definitely my rotary cutter. I should have failed kindergarten for my lack of scissor skills. I guess I'd have to say my seam ripper because I make many mistakes! I love vintage--this is a fun giveaway! My favorite sewing tool is slit up knife. My newest favorite tool is my Chaco liner -- the one with the chalk powder in the barrel and the little spiky wheeladoo thingy. :} Thanks for the chance to win! Best sewing tool ever: seam ripper! I love fabric marking pens. Your pile of vintage items looks fun. I love my OLFA rotary cutter. My favorite sewing tool is my machine. It's not fancy but it sure does the job! I love my vintage Viking sewing machine. The don't make them like that anymore. I love vintage anything! My favorite tool is my rotary cutter! I love my seam ripper. Typical, I know, but it's sooo essential! I too love my seam ripper! Rotary cutter, seam ripper, sewing machine... all fabulous, another favourite is my GO! cutter - love, love, love it! Favorite sewing tool is...unfortunately...my seam ripper, which I need much more often than I would like. 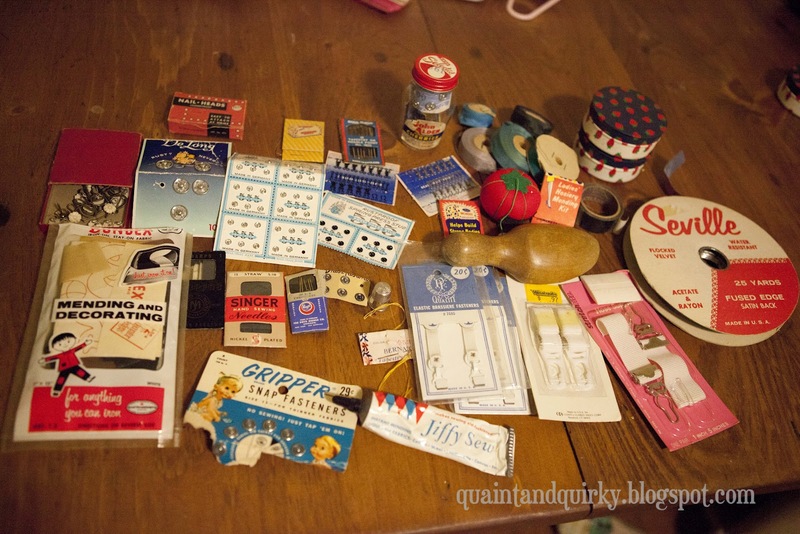 I love vintage sewing supplies and tools. This is a wonderful giveaway prize. My favorite tool these days is probably my new sewing machine. Is that cheating? I got a new machine about 4 months ago and we're still in that honeymoon period where it can do no wrong as far as I'm concerned. My favorite tool that I have is my rotary that my husband got me for Christmas! Not I am wanting a ruler to go with it so I can see through it! I love vintage. My favorite tool would be a plain old needle and thread. I love sewing and cross stitching!! Great vintage stuff! My favorite tool is this little wooden roller used for paper piecing. It works great at "ironing" the little pieces down without have to get up and use a hot iron. Thanks for the chance! Awesome! I love to collect vintage sewing stuff! I love, love, love vintage sewing supplies. My newest favorite sewing tool is my rotary cutter. I don't know how I managed without it. Favorite sewing tool is my rotary cutter and board. It's just so darn useful. I have also recently fallen in love with dressmaker's chalk; it works so much better than a pencil, which is what I used to use. What a fun collection of notions. I have been blessed to get things like that handed down to me from my Grandma and other friends - I also found a bunch once at a garage sale. I have been amazed at how fast I have used many of them up however. I would love to win. Oh, I love vintage sewing things! Thanks so much for doing this giveaway! My Invisible zipper foot is probably my favorite tool at the moment. I love vintage sewing stuff! I have alot of wooden spools of thread that I have found at thrift stores. It's neat to see the prices and the different companies. My favorite sewing tool at the moment is a ruler. It's 6 1/2" x 2 1/2". I like that 6 1/2" is small enough to fit in my sewing kit and the 2 1/2" wide is great and more convenient than just 1". I like my spring-action thread cutter. Thanks for the giveaway! My rotary cutter, but I do need to change my blade more often. Oh goodness! What a fun give-away! My favorite sewing tool...seam ripper ;-) It gets me out of horrid little difficulties rather regularly! My favourite is the new stitch ripper from Hancocks with a magnifying glass and a light - great for the eyes and working with blacks! I love vintage sewing supplies! I can't help to buy em when I see em! I keep them in a vintage sewing basket. There's just something about them that brings me comfort. • • • WOW! that's a great haul. Thanks for sharing. Love vintage! Thanks for the chance and sharing this giveaway. Oh I love vintage sewing things. Mmm, seam ripper is the one I need to have on hand and my pinking shears are the ones I like the best. They cut these tiny little triangles out of fabric that are cute and magically keep it from fraying! I am so in love with vintage items right now this giveaway is perfect!!! Thanks. I gotta say, I love my serger...does it count as a tool? if not, the rotary cutter and ruler. straight cuts are so easy!!! Those are so cool, thank you for the chance to win! What a very fun giveaway! I love collecting vintage sewing tools. I keep them in sewing baskets and jars. Thanks! I'm not sure how I ever lived without my rotary cutter. And my Gingher scissors. I have some vintage sewing supplies, too, especially my vintage buttons. I separated them by colors and display them in glass jars. Red, my machine is my favorite tool. Nothing is more fun then a big bag of unknown vintage sewing supplies! What a great giveaway--I love vintage supplies. The packaging is so wonderful too! Thanks! My MIL introduced me to quilting about 10 years ago. This weekend, I introduced her to the rotary cutter - so nice to return a favor! What lovely bits and bobs. I inherited a mix of vintage lace and old bobbins from my grandmother and her singer sewing machine which I love to look as it is sew beautiful. not sure about my favorite tool, but i know it feels like i use my seam ripper all the time! m favorite tool is my stilletto - saves my fingers all the time! thanks for the giveaway! I love vintage items,especially laces. I have my mothers old sewing box and some of the items she had are still in it. I would love to win these to add to the collection. Thanks for a chance to win them. I like my rotary cutter! I like my little pendant thread cutter. So useful. No topic needed here. I love vintage sewing supplies. It's so fun to use them and display them. That's such a beautiful and generous giveaway! I'm not sure about my favourite sewing tool, but one I am using wayyy more often than I expected is the little foldable scissors that my sister gave me last year. I have them in a little sewing kit in my bag all the time now and I'm forever cutting threads for something! Chopsticks! Seriously, I always have a chopstick next to my sewing machine. It's great to help nudge fabric, move thread, turn corners and tubs, etc. The rotary cutter is my favorite tool - such a timesaver! I love my scissors and my rotary cutters. Couldn't sew without them. Love my sewing machine (ha!) if that counts, if not, probably the rotary cutter! My favorite tool is my rotary cutter! Although I don't use it as much as I should! Has the be the rotary cutter. Great invention. I love my rotary cutter and my sewing machine. :) Thanks for the chance to win such fabulous vintage goodies! I know it's not a tool, but I love buttons! They're so fun! favorite sewing tool? yeah i'm pretty hip to my rotary cutter. LOL! how did you get into quilting? was it something you watched your mom do as a child? what inspired you to cut that first square of fabric? What fun stuff! I love my rotary cutter and rulers, couldn't live without 'em! Thanks for the giveaway! My favorite sewing tool - I am a ruler junkie. I love the Deb Tucker rulers and Creative Grids rulers. Thanks for the giveaway. FABULOUS!!!!! What a clever and generous prize....sorry to say that I would not have been able to part with these cool things....like your style...signing up for your blog! Check my new blog out, too! On the QT-Quilting tangents. Thanks so much for participating and for offering this lovely prize. I love all things vintage so I might just display them if I won. I am enjoying the going to all the different blogs and seeing what everyone is interested in and making, very inspiring! Now I just need to get off my rump and make something. . .LOL! I live in New York, just a little fact about me. I love my seam ripper and fabric scissors - they have little skulls all over them! I think that my favorite sewing supply is an abstract... and it's space. Space to properly lay things out and cut, space to leave my machine set up for a few days... Something I certainly don't underestimate the usefulness of these days! Oooh, what a lovely bundle of vintage goodness! My favorite sewing tool...hmmm...I guess my seam ripper. I'd be lost without that thing. I love, love, love old sewing supplies. Thank you for the giveaway. My favorite tool is my seam tippers and yes, there are ,more than 2! I have a love/hate relationship with my seam ripper - and I know I am not the only one! Thanks for the great giveaway! My favorite sewing tool is my bias tape maker. I use it all the time. Thanks for the giveaway! I have my grandmothers tin of buttons and I love sifting through them and seeing the bits of cloth still attached to some when she cut the buttons off of a piece of clothing. Many of the buttons are from my grandfathers police uniforms...I use those along with bakers twine when I wrap special gifts for my mom or brother. I use my father in law's sewing machine. It is from the late 40's and sews perfectly. I adore my ginger scissors. They are my go to scissors when it comes to cutting fabric. I'm just having fun jumping around different blogs taking part in the giveaway. Your giveaway is very generous! Thanks for chance to win a bunch of cool sewing stuff! Its the seam ripper! Thanks so much for the chance! I love my seam ripper, is my best friend. Ooo... My favorite is probably my French Curve. I'm forever fiddling with patterns and it's ever so helpful when re-drawing curvy bits! I love my tiny rotary cutter! This is awesome! Makes me glad I have a U.S. address... thanks for the lovely giveaway! Oh I love your stash of vintage supplies! I always find them fun and endearing! Thanks for a great giveaway! My favorite sewing tool is the rotary cutter. I love my rotary cutter. Thanks for the great giveaway. currently my favorite tool is my Accuquilt cutter... and I just got Martelli's strip ruler and their cutter. Thank you for participating in the giveaways. I love all things vintage, and I regularly shop at Estate sales. I hate to cut, so right now, my favorite item is my accuquilt cutter! I love a good pair of sharp dressmakers shears. Nice sharp scissors are my favorite tool. I have a pair for every need. Love the vintage goodies! Wow what an awesome giveaway, thanks for the chance to win. These look really cool! I have a few things from my grandma, I especially love the old buttons and beads! Don't know if I count since I'm in :) Alaska. Sorry if that doesn't count as "the US" :) I don't know if I could bear to give up all that cool stuff!! Seam Gauge....I'm lost without mine! I love my rotary cutter. Thanks! I like all my sewing tools. Good scissors are always great to have. A seam ripper is my least preferred tool to use, but the one I miss the most if I lose it! My rotary cutter and my iron.